BSCA was founded in 1967 and promotes the sport and pastime of cycling for all young people, whether experienced or beginners. How do we do this? By holding a series of regional and national competitions in eight different cycling disciplimes in a safe and controlled environment. We also offer coaching events, bike clubs and comprehensive training packages for Leaders. As a result, this site will no longer be updated. There has been a change of committee members of BSCA with Sue, Tim and Anthony Knight all retiring with immediate effect. All correspondence for events should be sent to Mandy Parker​ at mandyparker2@ntlworld.com apart from membership which is continuing to be dealt with by David Shrubbs​ until new committee members are appointed. Bear with us while we transfer details from Sue. Also we have to wait for handover of the website. Until then all updates will be on this Facebook Page. There will be a committee meeting at 10am in the Dog Pub, the Harverter Pub, next door before the AGM. At the AGM We need as many people as possible to attend to take the organisation forward.Please spread the message around. We would like as many people as possible to attend so we can determine the future direction of the association. Travel expenses will be paid but not accommodation. Sue Knight is no longer acting as Secretary for BSCA as she has retired so All enquiries with regard to BSCA and any Agenda items, please forward to Mandy Parker, mandyparker2@ntlworld.com by the 20th February for inclusion in the Agenda. Prior to this will be a BSCA Committee Meeting to be held at the Harvester Pub called the Dog Pub which is next door at 10am. 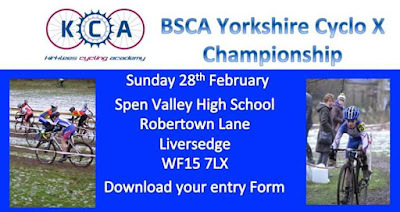 The next BSCA Yorkshire event is the BSCA Cyclo Cross Championships. We will be posting more events as we finalise details over the next couple of months. More details are on the B.S.C.A Facebook site. Many thanks to all the volunteers from West Riding Track league and East Bradford Cycling Club 9and Leeds mercury) for helping to put on another successful event. Great day at Pontefract Grand Prix for our East Bradford Riders. Plus great ride from Lucien. British Schools Cycling Association Yorkshire Time Trial Championship Under 15 and Over 15 Categories. Next British Schools Cycling Association event is the Regional Yorkshire Time Trial Championship for the Under 15's and Over 15's, riders born between 1st September 1995 and 31/05/2001 are eligible to ride. All competitors need to fill in an entry form which is attached. Postal entries close on 4th May with limited entries on the day due to maximum numbers on the course.